When you choose Custom Window Designs for your new or replacement windows, entry doors or sliding doors, you’re choosing over 34 years of experience in manufacturing and installation of only the highest quality. 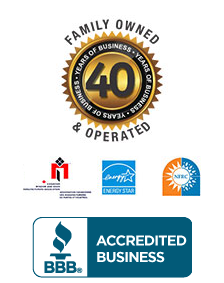 We offer a over a combined 150 years of experience in the installation and custom fabricating of all our products, and are Canadian Window & Door Manufacturers Association (CWDMA) members. We’re also Gentek Premium Renovator Gold Club members. You can have confidence in dealing with a renovator whose excellence is recognized nationwide, backed by a written 5-year workmanship guarantee and an exclusive 25-year manufacturer warranty. As our tagline says, we use NO SUB-CONTRACTORS. What does this mean for you? This means that all of our employees work for us – not a 3rd party who we would have little control over. This allows us to guarantee the quality and timeliness of the job, which means savings for you! Our happy customers in the Greater Toronto Area (GTA) and across Southern Ontario are always pleased with the work completed on their home because we don’t stop until our customers are 100% satisfied with the job. Check out our customer testimonials and our rating on Homestars.ca to see what people are saying about our work! Looking at hiring a company for your replacement windows or doors? Contact Custom Window Designs today! Custom Window Designs is committed to respecting the privacy of individuals and recognizes a need for the appropriate management and protection of any personal information that you agree to provide to us. We will not share your information with any third party outside of our organization, other than as necessary to fulfill your request.